From October 2015 to February 2016 the Trail by Fire expedition surveyed the length of the Nazca plate subduction zone making gas measurements at 15 active volcanoes from Peru to southern Chile. With nearly 200 active volcanoes (4 currently erupting and 18 in a state of unrest), the South American Andes is one of the world’s most tectonically and volcanically active regions. The remote locations, high elevations (up to 6893 m) and lack of established trails to the summit of most of these volcanoes resulting in this entire region being almost absent in the global database of volcanic gas emissions. The objective for Trail by Fire was to correct this and take a snapshot of volcanic emissions at the scale of an entire volcanic Arc. In this article, the team summarizes their time in the field. For more details, photos, and videos read their blog entries from the field here. The fundamental question we hoped to answer on the Trail by Fire is: How efficient are subduction zones at recycling volatile elements such as water and carbon dioxide? Is our planet ingassing or outgassing? We know fairly well the quantity of volatiles subducted into deep Earth but have few constraints on how much goes back out. 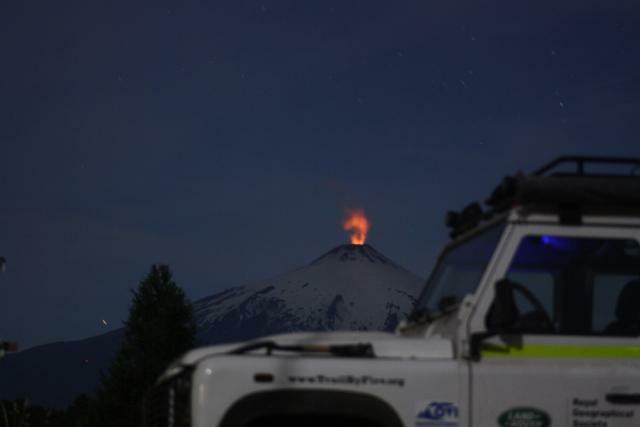 Our expedition team was composed of six young volcanologists and a specially modified Land Rover Defender converted into the world’s first all-terrain mobile volcanic observatory. This custom-made vehicle, prepared by Land Rover Special Vehicle Operation together with the scientific team, allowed us to access remote volcanoes, never studied before. Key modifications included an extra-large and independent battery system, which powered the scientific instruments in the deep field, and a large pull out tent which served as both living and office space during the expedition. Left: Inside the Land Rover Defender: Discernible items are from left to right: compressed reference gases, Delta Ray Isotope Ratio Infrared Spectrometer, computer, coffee cup holders and fridge. 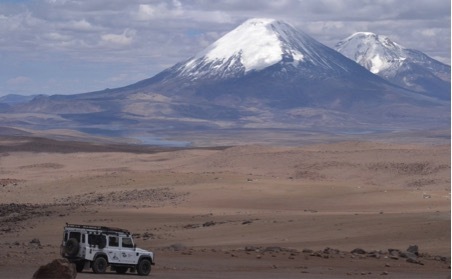 Right: The Mobile Volcano Observatory deployed at Ubinas volcano (southern Peru). UV camera and UV spectrometers deployed outside are operated from inside the tent where laptops are kept safe from the constant blasting of ash. There are two key facets to studying volcanic gases, determining their composition (i.e. their chemistry) and measuring their flux. Both of these pieces of information are important for determining a volcano's activity level as well as being a key starting point for other research streams such as understanding volatile recycling (see above). Gas emissions are a fundamental parameter in volcanology, much as wind speed is a fundamental parameter in meteorology. In order to measure gas composition we have to go directly to the source. This means climbing to the summit of volcanoes and, more often than not, climbing down into their craters. The rule of thumb is if you can breathe without a gas mask you’re not close enough. When the gas source is within a steep crater at the top of a nearly 6000 m high volcano, such measurements aren’t trivial, hence their rarity. Once there, we pump the gas through a series of electrochemical sensors, each responding to a specific target gas (the Multi-GAS instrument). We also try to capture samples of the gas, free of any air contamination, in specially designed glass vials for later analyses in the lab. These techniques give us the gas composition. Left: Probing good sampling sites at the summit lava dome of El Misti Volcano (Southern Peru). Right: Being belayed down the newly formed eruptive vent at Chillan volcano (Southern Chile). 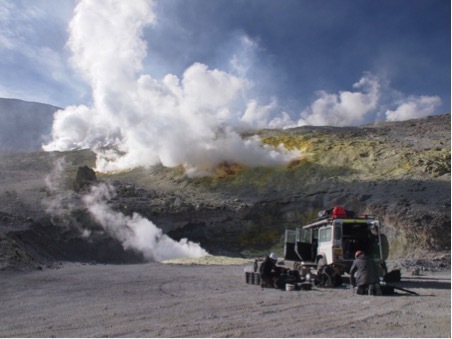 Ultra violet spectroscopy and imaging allow us to determine the flux of sulfur dioxide (SO2) from a volcano. The measurements are taken from a distance (usually a few km) so that the whole volcanic plume can be measured. Like all spectroscopic techniques, what we are measuring is “missing light” which has been absorbed by different gases in the volcanic plume as it passed through. With careful processing, the amount of “missing light” can be converted into an amount of SO2. We measure the amount of SO2 in a transect across the plume, and then combine this with the speed at which the plume is moving to estimate flux (flux = amount of gas per unit time). We can then combine our SO2 flux measurement with our measurements of composition (i.e. from direct sampling) to determine the total gas flux from the volcano. For example, if we measure twice as much carbon dioxide as SO2 with the Multi-Gas instrument and then measure an SO2 flux of 200 tonnes per day with UV spectroscopy, we can infer a carbon dioxide flux of 400 tonnes per day. During the expedition, such measurements of gas composition and flux were made for the first time at seven volcanoes. We visited all 15 target volcanoes, giving us a high quality snapshot of gas release across the entire volcanic arc. Typically we only stayed a few days to a week at each volcano, therefore we only measured the natural variability at each volcano for short periods of time. In order to extend our measurements over time we compared our ground-based measurements with those taken from satellites. In collaboration with partners at JPL and NASA, we tracked the progress of the Trail by Fire team down the Andes using two satellites, Earth Observing 1 (EO-1) and Terra. In particular, we used two sensors; Hyperion to monitor the thermal power output (which tells us how much new hot material the volcanoes are erupting), and ASTER to measure the amount of gas in the volcanic plumes. The challenge here was logistical as well as scientific – we had to somehow get the Land Rover and the satellites in the same place at the same time within the confines of orbital parameters, permitted satellite manoeuvres, and the sequence of volcanoes we were visiting, all without running out of fuel and water. One day a mathematician will win a Fields medal for solving the travelling volcanologist’s problem, but in the mean time we did a pretty good job. By providing a rolling best guess of our itinerary a week in advance, we were able to time satellite acquisitions near-simultaneously with field visits. These observations will hopefully allow us to extrapolate our point observations in space and time, and put them in the context of changes in activity over the past decade. Currently, we are processing the back catalogue of satellite data to build time series of activity at all the volcanoes we visited, to compare with our field observations. Clear night sky at Villarrica volcano (Southern Chile) after a day of simultaneous satellite and ground-based remote sensing acquisitions. Besides measuring the flux and composition of the gas emitted by volcanoes, we were also interested in determining the origin of these volatiles. A lot happens between the times volatiles are “sweated-off” the subducting slab and released by volcanoes at the surface. In order to determine whether emitted volatiles originate from the subducting slab, mantle, or crust we need to determine their isotopic signature. The typical way of obtaining this information is to take pristine gas samples (free of air contamination) in the field and bring them back for analysis in the lab. Such samples were taken all along the Trail, and were completed by direct measurements of carbon isotopes in the field using a Delta Ray Isotope Ratio Infrared Spectrometer. Another novel approach of the Trail by Fire was in the intensive use of unmanned aerial vehicles (UAV). Three types of UAV were flown during the expedition, each fitted with a different scientific instrument. 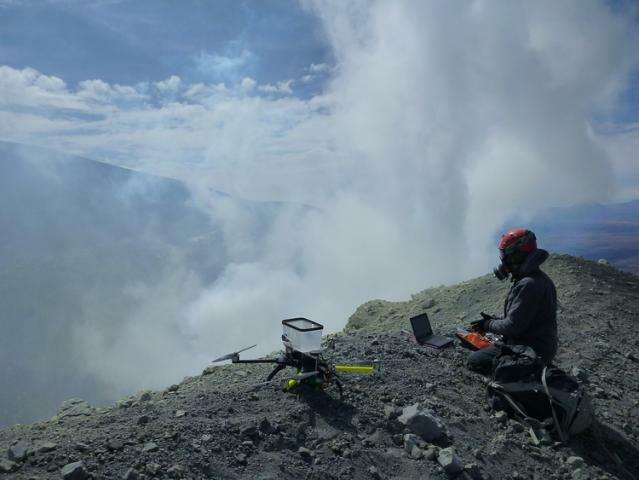 The first UAV was fitted with an Ocean Optic Flame spectrometer in order to perform air-born traverses underneath volcanic plumes, measuring SO2. The second setup was flying a miniature version of the “Multi-Gas” measuring the ratio of CO2 to SO2 species in the plume. The last setup was capturing direct samples of the plume brought back for further analysis at the mobile observatory. Gas sampling-copter, before take-off at Isluga volcano (Northern Chile) on Christmas day. Along the Trail, the team worked closely with local volcano observatories, the Observatorio Vulcanológico del INGEMMET (OVI) in Perou and the Observatorio Volcanológico de Los Andes del Sur (OVDAS) in Chile. In addition, colleagues from the University of Palermo and INGV Palermo joined the team for part of the Peruvian leg of the expedition. The involvement of these partners and friends, together with the scientist’s home institutes and many sponsors, made this expedition possible. After 17000 km of traveling, mostly on dirt roads and tracks, the expedition ended. With nearly a terabit of data acquired during the four-month campaign the team is now hard at work with post-processing. We expect we will publish the first scientific papers using data from this expedition by the end of the year. The “Trail by Fire” expedition was led by Dr. Yves Moussallam (Scripps Institute of Oceanography, USA) and composed of Dr. Nial Peters (University of Cambridge, UK), Dr. Aaron Curtis (New Mexico Tech, USA), Dr. Ian Schipper (Victoria University of Wellington, New Zealand), Dr. Talfan Barnie (Open University, UK) and Dr. Philipson Bani (Institute of Research for the Development, France). 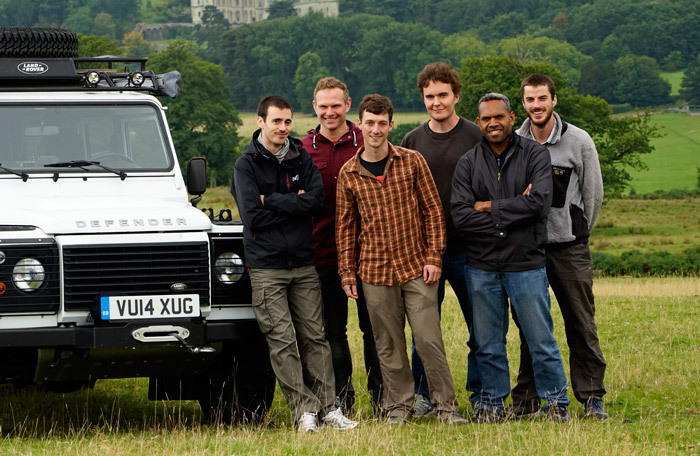 The expedition received the 2015 Land Rover Bursary, run by the Royal Geographical Society (with the Institute of British Geographers) on behalf of Land Rover, and supported by DCO’s Deep Carbon Degassing (DECADE) initiative. Additional sponsors included Ocean Optics, Thermo Fisher Scientific, Crowcon, Air Liquide, Turbo Ace and Cactus Outdoor. The Trail by Fire team. From left to right: The Mobile Volcano Observatory, Yves Moussallam, Ian Schipper, Aaron Curtis, Talfan Barnie, Philipson Bani and Nial Peters. DCO Highlights Blog: Embers Alight on the Trail By Fire 1.5! The Trail By Fire crew is at it again! Regular updates from the Trail by Fire Team, adapted from their blog.